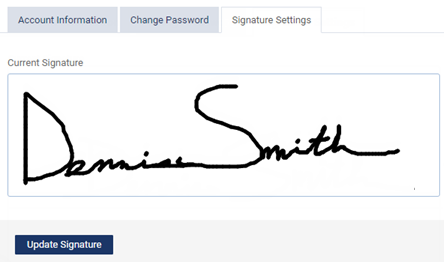 After your user account is created, you can add a digital signature to your account so that you can sign clinical notes. You can change the signature as needed without affecting documents that have already been signed. Note: Only you can set up your signature. Administrators (or, if you are an administrator, other administrators) do not have access to your signature and cannot therefore change it for you. On the User name ("Hi, [your user name]") menu, click (or tap) My Account. The My Account page opens. On the My Account page, click (or tap) the Signature Settings tab. Click (or tap) Create Signature to sign for the first time. Click (or tap) Update Signature to re-sign. 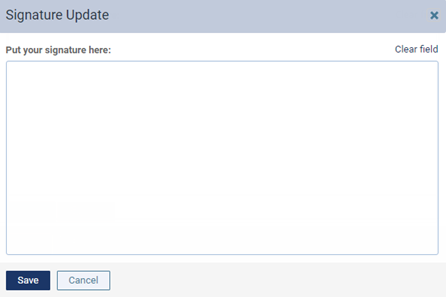 The Signature Update dialog box appears. Sign using a mouse (or a stylus, or your finger). Tip: At any time before you click (or tap) Save, you can click (or tap) the Clear field link to clear the signature so that you can re-sign. Note: When you add or change your signature, a notification is sent automatically to the email address entered for your user account.